A peacoat should be a staple of any man’s colder weather wardrobe. It can be worn both formally, and more casually. They look great, and rugged, and are always a good outerwear option. Earlier this season we pit Banana Republic’s peacoat against J Crew’s in an attempt to find the better of the two. Neither one, though, was quite perfect, and so our search continued. Spier & Mackay — a company whose shirts we really like — has a peacoat that apparently is cut slim, and is solid quality, on par with the rest of the garments they make and sell. So, of course, I had to give it a shot. Here is what I thought. As far as looks are concerned, this peacoat is everything you could ever want in a peacoat, and then some. I absolutely love everything about how this coat looks. For starters, it has a classic 6-button front (I have seen some recent peacoat with four buttons; they don’t look right). The lapels are perfectly proportioned. It has both flap pockets as well as vertical slit pockets, so you can more easily get your hand into them for warmth. It has a cool detail which I like, which is a line of stitching and raised fabric at the top of the 5 buttons on the sleeve. It’s unique without being flashy. I am also a very big fan of the back waist half-belt. While most won’t really use this to actually adjust the waist sizing, it’s more intended for looks than anything else, and it is a classy detail that I personally am a very big fan of. The one thing I perhaps think could have been toned down is the center vent layering. There are a whole bunch of layers beneath the rear vent, as well as a whole bunch of buttons. This is not typical of a peacoat, and while it is generally not very visible, it comes off as a bit strange to me. Still, as far as the design of the coat is concerned, this is not at all a dealbreaker. The fabric is beautiful as well. The color is spot on — it is noticeably grey (as opposed to black, which some charcoal greys can appear as), while at the same time still being dark. This means this coat goes with literally any outfit and color combination on the planet. The fabric is an 80% Merino Wool/20% Nylon blend, and feels soft with the slightest bit of scratch. This is honestly the perfect texture for a peacoat. You don’t want it to be smooth — you want the fabric to have some personality, and be rich, deep, and warm. At the same time, too scratchy and it borders on being uncomfortable. I think this peacoat nails all of that. 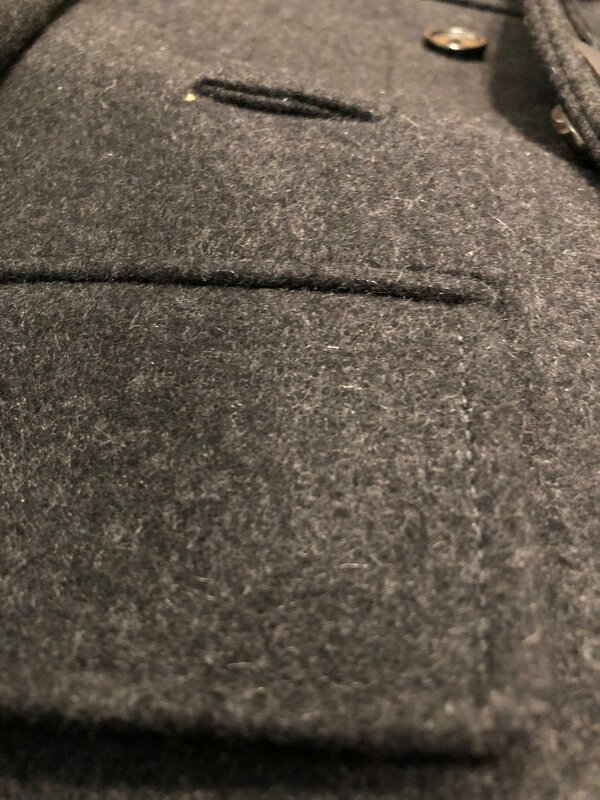 The buttons are sturdy and sewn well — they do not at all feel like they are hanging by a thread, ready to come off, as often happens with a peacoat (which sees a lot of stress on the buttons). All the stitching is done well, clean, and neatly. The jacket is also fully lined, and is likely to keep you warm without additional layers in moderately cold temperatures. It’s not super heavy, nor is does it have any quilted lining, or “heat tech” in the fabric like some other coats do. Still, it’s a solid top layer for cooler weather. On the other hand, I would not go out in a blizzard in this thing, obviously. It’s not a winter coat per se. Finally, as discussed above, this coat is very nicely detailed, and really gives off an impression of being very high quality and classy. In the product description, this coat claims to be cut like a suit — namely, rather slim for outerwear. They even suggest if this coat is really going to be used as a layer on top of a suit to size up. I didn’t listen to this, as most outerwear is much too big on me, so I gave the size S a shot. In the end, neither a size S nor M would work for me. This coat, at least on my body, quite unfortunately fits very strangely. The coat retails for $278, though is on sale now for $199. (It also comes in different colors.) Given the quality, style, design, details, and fabric of this coat, I think it is well worth it at either price! If, that is, it will fit you properly. And that might not be so simple to assume. Considering Spier & Mackay’s return policy is a little wonky, bear this all in mind before you decide to pull the trigger.